"Iceberg dynamics in modern and glacial oceans"
Icebergs released from the Greenland and Antarctic ice sheets drift in the modern high-latitude oceans, releasing meltwater as they go and capsizing when their shapes become unstable. The role that they play in the global ocean circulation and climate depends crucially on the iceberg drift trajectories, which often are interpreted using an empirical rule-of-thumb to account for the influence of winds and ocean currents. The flux of icebergs from Greenland and Antarctica has recently increased and is projected to further increase in the future, perhaps dramatically. This raises analogies to the Heinrich events of the last glacial period, when there were massive discharges of icebergs from the Laurentide Ice Sheet which are believed to have drifted enigmatically long distances in the North Atlantic and disrupted the global climate. 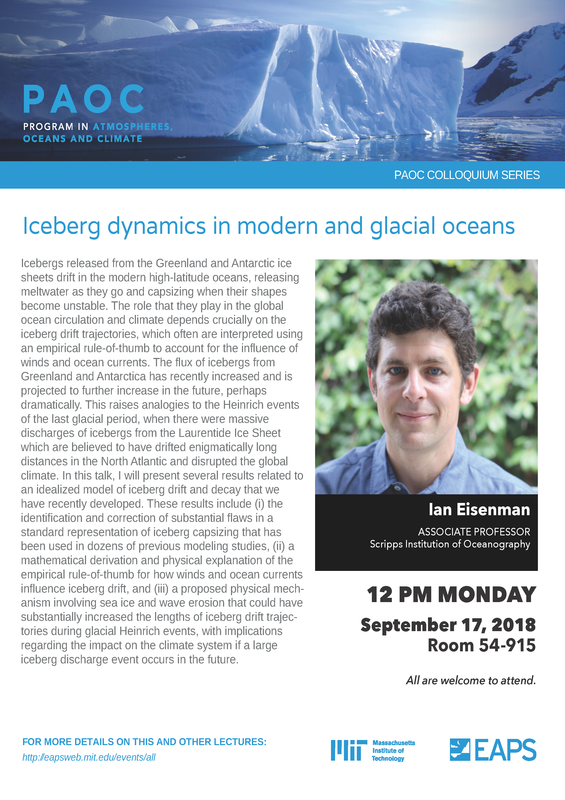 In this talk, I will present several results related to an idealized model of iceberg drift and decay that we have recently developed. These results include (i) the identification and correction of substantial flaws in a standard representation of iceberg capsizing that has been used in dozens of previous modeling studies, (ii) a mathematical derivation and physical explanation of the empirical rule-of-thumb for how winds and ocean currents influence iceberg drift, and (iii) a proposed physical mechanism involving sea ice and wave erosion that could have substantially increased the lengths of iceberg drift trajectories during glacial Heinrich events, with implications regarding the impact on the climate system if a large iceberg discharge event occurs in the future.